Myrtle Beach is known for its titles. The legendary resort town lays claim to a number of superior ratings based on polls conducted by a wide variety of news publications, hospitality organizations, and other groups. The city is among the best of the best in a number of national surveys, showing its popularity not only with locals, but also with writers, business executives, and tourism industry officials around the world. Just a partial list of recent accolades shows why Myrtle Beach is one of the nation's premiere vacation and entertainment spots. The prestigious Forbes magazine considers Myrtle Beach a good place to launch a business; the publication ranked the area 29th on its Top 200 list of Best Places for Business and Careers. The Myrtle Beach Airport appears to be an up-and-coming airfield. The Boyd Group, an industry researcher, noted the airport is the fourth fastest-growing one in the U.S. From 1994 to 2000, the airport grew 150 percent and air traffic there jumped 22 percent from 1999 to 2000. Always known for its astounding selection of golf courses, Myrtle Beach was named the golf destination of the year for 2000. The honor, bestowed upon Myrtle Beach by the International Association of Golf Tour Operators, was based on customer satisfaction, quality of golf courses and lodging, availability of tee times, and support from travel suppliers of condos, hotels and flights. 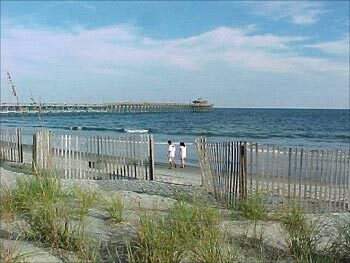 Of course, Myrtle Beach is a beach-lover's dream, a fact confirmed by USA Today, and as can be seen in local pictures. The newspaper's travel guide named Myrtle Beach the second most popular beach in the country for 2001, based on input from more than 3,000 readers.Myrtle Beach is also becoming known for its 1600+ restaurants. The area ranked number one in the nation for growth potential in 2001, according to Restaurant Business magazine. The Myrtle Beach market is growing twice as fast as Flagstaff, Arizona, the number-two contender, and nine times faster than the national average. In fact, growth has become quite a watch word for Myrtle Beach, and real estate in Myrtle Beach is in high demand for new homes, vacation homes, and investment property. According to figures from the U.S. Census Bureau in April, 2001, the Myrtle Beach Metropolitan Statistical Area is the 13th fastest growing area in the U.S. The area has experienced phenomenal growth in just a decade, mushrooming some 36.5 percent. In a report issued by the U.S. Conference of Mayors, it was revealed that the Myrtle Beach area tied for fifth place in growth, experiencing a 9.1 percent yearly growth rate for goods and services produced between 1990 and 2000.As these incredible figures indicate, Myrtle Beach is a city on the move, an oceanfront paradise whose best days are in front of her. The statistics simply solidify the city's standing as an outstanding place to work, live, or vacation.